Fill the cold pack canner with water and place it on medium high heat. Wash and sterilize the lids and pint jars. Then set them aside. Combine the sugar, cinnamon candies, cloves, ginger, water, vinegar, corn syrup and red food coloring (if using it) in a large stainless steel pan. Bring the mixture to a boil over medium high heat, stirring frequently. Add the apples and stir the mixture until the apples are heated all the way through. This takes about 5 to 6 minutes. Use a slotted spoon to fill the jars with the apples. Pack the jars to a half-inch from the top of the jar. Use a ladle to fill the extra space in the jars with the hot syrup. Be sure the apples are covered. Remove the air bubbles and add more hot syrup if necessary. Center the sterilized lid on the jar and screw the band down until resistance is met. It should be fingertip-tight. Place jars in the canner making sure they are completely covered with water. 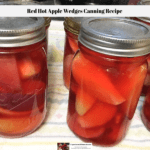 Bring the canner to a boil and process the pint jars for 15 minutes. Turn the burner off after 15 minutes. Remove the canner lid and wait for 10 minutes, then remove the jars, tighten the lids and allow the jars to cool overnight. Remove the bands and check the jars the next day to make sure the lids are sealed. If the lids are sealed, label and store the the jars in a cool, dark place. If the lids are not sealed you can either go back to step 10 and start over or put the jars in the refrigerator and use them right away.